Bucerias Penthouse Agua Azul in Zona Dorada Bucerias south of the footbridge is a luxury 3600 square foot Penthouse and is the best addresses in all of Bucerias. The Condominium complex, consisting of 30 units, stands in beautiful Bucerias, on the Riviera Nayarit with Penthouse.This quaint village maintains Old-World Mexican charm and hospitality, while catering to every modern need from restaurants to emergency services and grocery stores. Penthouse Agua Azul is a 2 story beautifully appointed and professionally decorated with high-end tasteful furnishings and artwork custom built to suit this oasis in the sun. Here you will find everything you can think of in modern conveniences, luxury and comfort. Sit on one of your two beautiful Oceanfront Terrace's (one rooftop 6th and 7th floor with an outdoor Palapa covered living room and plunge pool) and watch as the dolphins and Humpback whales play before you. Enjoy the sunsets with a cold beverage or beautiful glass of wine. What could be better? Here, you will enjoy a largest Infinity pool in town, 14 km of beach, a private gym, private and secure parking to name a few amenities. Located in the best section of Bucerias, Penthouse Agua Azul is steps away from both fine and casual dining, the town square with authentic Mexican shopping and lazy beach side watering holes. We, as a family, love Bucerias and love to promote this to others. We are lucky enough to own here, and enjoy hosting our likeminded guests when we are not enjoying time in Bucerias. no car needed - everything is within walking distance and the unit is top end in a high end building! Described as amongst the best rentals in Bucerias. 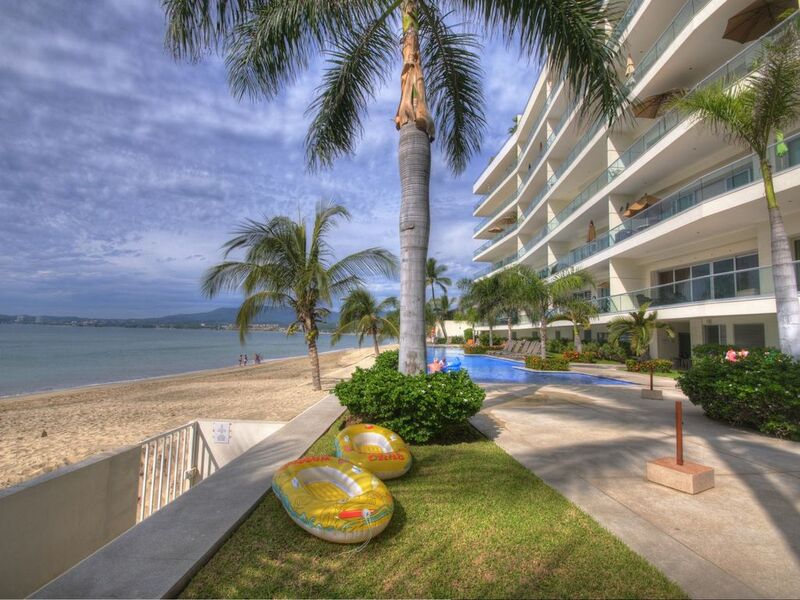 there is nothing more beachfront in Bucerias! lots of them, including all kinds of glasses, bowls, plastic cups etc. Every possible amenity is found in this Penthouse. Truly a luxury retreat at a value price. Fabulous home away from home. Loved this place! Extraordinarily clean, has everything you would need, very convenient to walk to everything, nice furnishings, quiet building, high end finishes, friendly security personnel. It was very hot when we were there so we didn't get to use the outdoor living room on the upper level....but could imagine this would be nice when not so hot. Air conditioners worked well, needed it in June. Took the city bus to WalMart and stocked up on breakfast and lunch items. Also convenient OXXO only one block away for drinks and snacks. Really appreciated the list of recommended restaurants from the owners.....tried several. Loved Toscana Mia (the best), Karen's (cash only) and Sukha (next door). Highly recommend this place for a home away from home feeling. Thanks Hal and Jill! This condo was perfect. It is nicely decorated and in a great location for walking to shops and restaurants. Infinity pool overlooking the beach was beautiful. We would go back. It was a pleasure to host you Denise! Hope to see you again in the near future and thank you for your review. Really enjoyed the stay in the penthouse. The location was the best for everything right outside the building. Great restaurants, coffee drinks. The owners and management were great to deal with and very responsive. Our grandkids had a wonderful time in the pool. Thank you for your kind review Ron. We enjoyed hosting you and your family and it makes us happy to read your review. Hope to host you again in the future ! We had a wonderful time! Everything about the stay was great! A very safe place to stay. We walked the cobblestone streets at night to the restaurants. The food was fantastic at every place we went. We only went to the restaurants recommended on the list provided! The view from the 2 floors of this penthouse was spectacular! We ate breakfast on the terrace and it felt like heaven. Teresa was very efficient and quickly responded when we needed her. This is a beautiful, spacious condo in a secure building, great location. The owners are lovely to deal with. I can’t really find much room for improvement! Thank you Mary-Beth - It was our pleasure to host you and we hope we have the privilege to do so again very soon!! Our family enjoyed a wonderful holiday at Agua Azul and found it to be a spacious and gracious environment with plenty of room for three adult couples. All of the staff at the Punta Arena complex were friendly, very helpful, and kept everything pristine. Most of our days were spent on the beach but we enjoyed the small town feel of Bucerias in the evenings. We took day trips to San Pancho and Sayulita and were happy to return to quieter Bucerias , sleeping with the doors open and hearing the surf. The proximity to the airport and the larger grocery markets was great. We sampled several local restaurants and our favorite was La Negra. Try the duck tacos! Thank you for your kind review! It was a pleasure to host you and we look forward to hosting you again very soon! You are always welcome back to your beach home away from home! This Penthouse is located in the quaint, safe, friendly town of Bucerias - from here, everything is walkable!